Yikes–this “writer-friend” feels like she’s been misunderstood & then to have the misunderstanding envoked in The Blog–she hastens to clarify!! I’ve staked my life around “the sweet, poignant internal reality of all things,” the daily reawakening and preservation of this internal world. My literary Bible is Woolf’s The Waves, which is nothing so much as an attempt to communicate “the sweet, poignant internal reality of all things.” Oh, the inadequacies of email! I intended “preciousness” in the colloquial sense, as in when my editor slashes one of my cliched paragraphs & writes in the margin “GETTING PRECIOUS HERE,” by which she means only that I need to work harder to bring linguistic life to worn-out sentiment. Think of the “precious” rhetoric that Bush uses in his State of the Union addresses; I meant only that if we, as writers, aren’t interested in alluding to/envoking the same mythologies, we need to articulate the internal landscape in ways particular to our vision. All of this to say I think maybe we’re more on the same page than my poorly-articulated email made it seem. Have a wonderful vacation & know you’ll have a proper epistle from me very soon. Hope you’ll read it under a tree along with Gilead! We have had a hawk in our yard in Baltimore City. We usually see them down the street at the park or at a distance in the sky. But this one’s been stalking our yard all summer and has stolen the eggs of robins. Two of them of four managed to survive, and we were grateful. I am such a fan of the birds. It is hard not to give human qualities to animals that mate for life, nest and live in the same place every year, and grieve over their lost families. 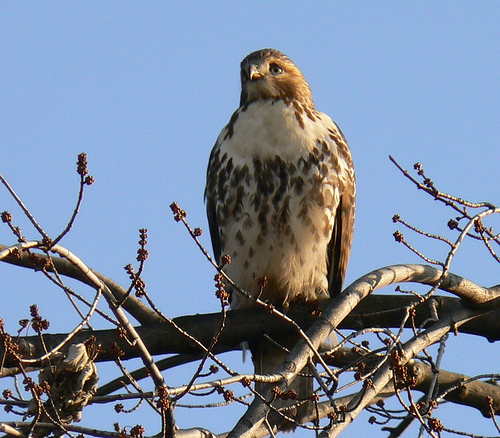 Hawks are amazing and graceful and beautiful, even when they’re stealing a future life. But I hate it. What I learn from the birds is that “why can’t we all just get along” is answered so succinctly by them.